The Unico Leela Hotel Nana is conveniently located in the busy Sukhumvit business district on Sukhumvit Soi 3, just opposite Bumrungrad Hospital. It is within easy distance of the BTS Skytrain station "Nana", or just a few footsteps from "Nana Pier" Station of "Klong San Saeb" on the the major Bangkok canals still in daily use. From here you can easily reach Central World, Siam Square, Royal Grand Palace etc., via regular klong boat, an experience that will take you back to when Bangkok was known as the "Venice of the East"
1. Bookings are required to make in advance prior to arrival. 2. Full prepayment is required either by credit card (Visa, Master, JCB, AMEX) or bank transfer. 3. For booking made less than 7 days prior to arrival, please submit your credit card details in order to guarantee your reservation. 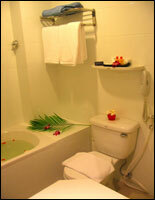 If no credit card details provided, booking will not be processed. 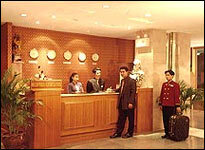 - Once booking is confirmed, we will automatic charge from your credit card details provided for total amount. - If booking is not confirm, there will be no charge on your credit card for the processing fee at all. 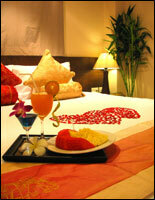 The Unico Leela Hotel Nana is pleased to welcome you. 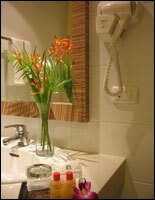 It offers 87 Standard and Deluxe Rooms to make your stay a comfortable experience. The Standard Rooms offer the comforts you'd expect from a hotel :- Air conditioning, en-suite bathroom with shower (hot and cold water), cable TV, minibar. In addition to the conveniences of the Standard Room, the Deluxe room offers more expansive comforts, a full bath with complimentary toiletries, additional living space with comfort sofa. 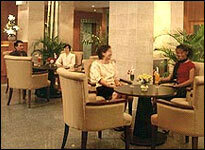 The coffee shop is open 24 hours a day and serves both international and Thai cuisine. Here's the ideal spot to enjoy either just a snack or a full a la carte meal, any time of day. The lobby is an ideal meeting place, or just a quiet break from the busy exertions of the day. The Lobby Bar is open daily from 6 p.m. to midnight. Here's the place to relax after a busy time shopping or business. The perfect place to relax and enjoy a cold drink or delicious cocktail. The friendly staff at the reception are at your service 24 hours a day. Late arrival or early departure is no problem - you're always very welcome. 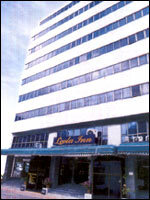 The Business centre, open from 9.00-17.30 hrs. every Monday-Friday and from 9.00-12.30 hrs. 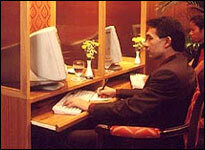 Saturday, offers a wide variety of business services including internet, Fax and secretarial services. The Unico Leela Hotel Nana offers a special room service menu, available 24 hours a day, to satisfy your dining pleasures in the privacy and comfort of your room. Located just off the lobby, the perfect place to pamper your beauty and relaxation needs ; from hairstyling to relaxing Ancient Thai Traditional massage. 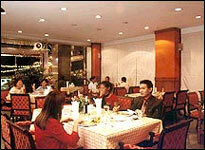 The Unico Leela Hotel Nana kitchen is ready to prepare for you a wide variety of both international and Thai cuisine. In the morning an extensive international buffet from 06.00-10.00 hrs. and the remainder of the day a great variety of outstanding menu items for your dining pleasure.